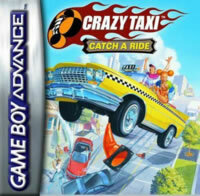 How can you wrong with a title like "Crazy Taxi"? I suppose you could make it NOT about taxis. Or you could make it lame and boring and undeserving of the title "crazy". You could make the music as interesting as a moldy mop. Or you could slap a sticker on an empty cartridge and try to sell it off as a game called "Crazy Taxi". 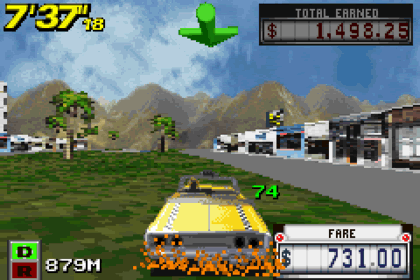 In any case, if you happen to find a Game Boy Advance game called "Crazy Taxi", you are in for a legitimately crazy time! At first, I was hesitant. After all, I was expecting crazy things from the start, not muted silence during the opening credits! I braced myself for disappointment. Then I heard it. The crazy came rising from the depths of the game like a herd of buffalo with bees up their butts. "IT'S PARTY TIME!" I looked at the clock. Indeed, it was the time which is dedicated to partying hard. The music didn't have any lyrics to it, but it just sang of "CRAAAZY". Before the game even started, I could tell that I was in for a "crazy" time. The game has two modes of how you can play. There is the "normal/timed" modes and something they like to call the "Crazy Box". In the normal modes, the player picks up passengers marked with a giant floating "!" and take them to their destination by any means before the timer runs out. And when I say "by any means", I mean driving on the wrong side of the road and plowing through grass and water. I'm not really sure if I was supposed to drive on the wrong side, but I did it anyway. You get points sometimes for making bumpy jumps over big hills or passing certain cars. Overall, the player has to get people from Point A to Point B as fast as possible. Luckily, there's always someone waiting at Point B to get picked up so it's more like A to B to C to D and so on. Some of the game's play modes are really un-fare. I didn't spend much time with the "Crazy Box". It's just a series of challenges that are almost impossible and don't give much direction as to what you're supposed to do sometimes. The first one I tried had me trying to reach a jump of 150 feet or more. After failing a bazillion times, I found out you can start faster if you put the car in reverse and then accelerate over the almost 90° ramp. Another challenge was simply explained as "Crazy Flags". It starts you out on the beach with no flags in sight. I thought, "Maybe I'm supposed to drive head on into the ocean!" After all, these cars have the magic of Jesus and won't sink into the rendered depths below. Nope, that wasn't it. I played through several times going back and forth on that stinking beach and didn't once have a clue as to what the game meant by flags. Another challenge had you popping bubbles, a.k.a. giant gumballs, in a certain amount of time. In case you couldn't tell, everything in this game is timed. There were several other challenges on different difficulties that the player can try out, but I wasn't lead to try them out anytime soon. If you want to, go for it! Drive yourself crazy. For a Game Boy Advance game, the graphics really aren't tooooo bad. I mean, they are pretty shabby, especially when it comes to the buildings. But the taxis look pretty good. You can choose between a few different taxis and drivers, but none of them seem any different than the others. It's all about personal preference, I suppose. Sometimes, the music is very overpowering, so I'd suggest turning the background music down before heading out onto the streets. Don't like the music? You're in luck! There are several different almost identical craaaazy tracks to choose from! One thing that drove me nuts in the game, however, was the voice acting. It all sounds more fuzzy than crazy. When you're driving a passenger to their destination, they'll constantly repeat "Go straight!" Sometimes, male passengers will yell at you with female voices. You do almost nothing and the passenger will exclaim, "Aw man, you're the best!" These passengers are the worst backseat drivers ever. I'd rather have a Doberman with croup barking at me from the backseat. Oh well, at least the cab fare is normally in the thousands of dollars. 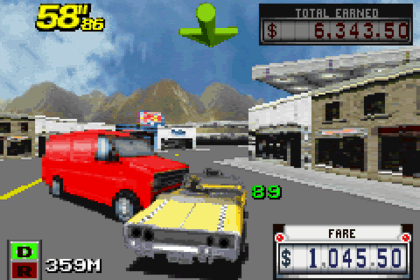 Overall, Crazy Taxi: Catch a Ride is one heck of a crazy game. Although it's not the best to look at, it is quite a fun game! If you can overlook a few flaws, I guarantee you'll come back to this crazy game for a crazy ride in a crazy taxi. You crazy person, you.